Q: "How do you feel entering the Ro8?" A: I" feel really happy. I want to win the last season of WoL, and enter HotS with a happy feeling"
Q: "How do you feel you played your games today?" A: "I thought I could win the first game and face Soulkey but Squirtle prepared very well and I lost helplessly. 무슈 J 때와 똑같이 이렇게 두 번이나 이기고 올라와서 조금 죄송한 기분이 든다 (Not completely sure what this means)"
Q: "None of your games were particularly easy today"
Q: "Today MKP tried a variety of strategies, but did you anticipate such a variance in strategies?" A: "MKP did not use a forward Barracks initially. When he faced Soulkey, he did not proxy a Barracks, which let me judge that he would not use such a strategy. So from the first game, I stayed calm, and scouted diligently from the beginning"
Q: "After Squirtle put you in danger of elimination, you faced him again. What was the burden?" A: "I didn't have a burden. It was an incredible important game because I feel my skill has been declining recently. I was focused purely on winning." Q: "You qualified for Code S next season. For the HotS season, how are you preparing with gradually transitioning?" Q: "Your next opponent is STX's INoVation. How do you expect the games to end up?" A: "I was watching INoVation's games and know he is a great player. But personally his style is easy to decipher and I like playing against that style." 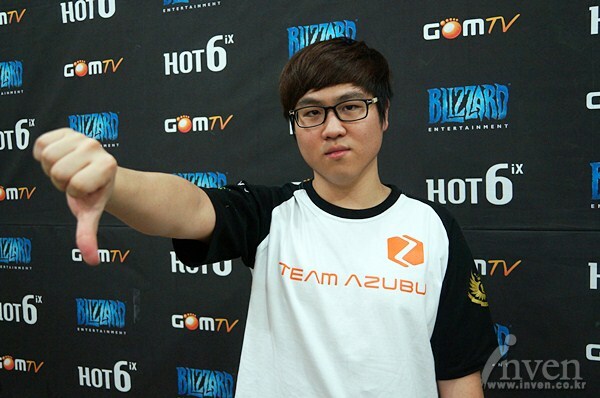 Q: "Your were signed to a new team AZUBU recently. What is the atmosphere of the team?" Q: "Do you think you can win this season?" A: "It is good to hear from the the other side "I will win. I will win," which was said a lot, but if you say it a lot, I end up losing (laughs). I want to say I will win, but because this is the last WoL season I will prepare extensively and show off my best." Q: "Do you have any final words?" A: "I want to give a special thanks to director Im Seong-Choon for driving me during a holiday even though his condition isn't great and drove me to my game. I want to thank the director, MC, HerO and Center for helping me practice, and to the other members of my team I would like to say thanks. When I was in TSL, I thought I was the best Zerg. I think one of the best Zergs currently is HyuN. I want to prove that TSL was the Zerg powerhouse of WoL. Finally, I want to thank our team sponsors Razer, the fans who are enjoying Sul-Nal (Chinese New Year), and eat plenty of ddeok-gook (Rice cake soup), and receive a lot of blessings. We have a new AZUBU logo so we can look better"
*I'm not finished translating some of these because I'm either not sure what they mean and/or confused. If anyone could help in translating, please do. Thank you, I'll make sure never to do that again. Symbol started to look a little like his old self today rather than the guy who got dominated by Baby and barely made it back into code S. Innovation might be the hottest terran right now, though, so it'll be pretty tough for him to win imo. So...are you doing Soulkey's interview too? I kinda dislike this kid with his thumbs down. Really hope to see him lose next round. I'll try to do it, but it might take a bit more. Sorry, but I'll try to make sure it comes out ASAP. I think this means in the season sponsored by Mon. J, he advanced twice by winning in the same manner so he feels a little sorry. ^ That's the best I could do. Oo;; New translator on the block? Is this a challenge ? Nah, I didn't even finish the Soulkey one, I don't have your work ethic. Wait, So Azubu is now sponsered by Razer?